St Peter Thomas was perhaps the most important - certainly the highest-ranking - Carmelite of the fourteenth century. Scholar, curialist, diplomat and preacher, St Peter performed remarkable all-round service for the Church in the middle of the century. A native of Périgord, and relatively low-born, Peter was successively bishop of Patti and Lipari (1354), then Koroni in Greece (1359), archbishop of Crete (1363) and finally Latin patriarch of Constantinople (1364). He was clearly regarded as a trustworthy ecclesiastical administrator and pastor, and particularly skilled in negotiating between rival parties. As papal legate in the East, he preached and served on the crusade of 1365 led by Peter I of Cyprus that captured Alexandria. Peter's activities placed him at the centre of the governance of the Latin Church in the eastern Mediterranean in the mid-fourteenth century; a period in which Crete and the Aegean were under Venetian rule, and the Lusignan kingdom of Cyprus and Frankish lordships in the Morea continued to flourish as outposts of western chivalric society and culture. Much of Peter's episcopal and legatine work concerned relations between the Latin ecclesiastical hierarchy and Greek-rite indigenous communities. Most of what we know of Peter comes from the Life written after his death in 1366 by Philip de Mézières, chancellor of the kingdom of Cyprus, and a keen advocate of the crusade. He witnessed miracles performed by Peter in Cyprus, and accompanied him on his preaching tour in France and on a curial mission to Milan. One of the features of Philip's Life is his understanding that despite high office, Peter remained a Carmelite, with the devotion to the Blessed Virgin characteristic of the Order. If de Mézières' Life is the most intimate of accounts of Peter, it is not the only one. The Franciscan provincial of the Holy Land, Jean Carmesson, also wrote a summary biography, and in 1637 the Irish Franciscan scholar Luke Wadding collected a group of twenty-nine papal bulls connected with Peter's work as a curialist, introduced by a further account of his life and work. These sources provided the raw material for the edition of Peter's life produced by the Bollandist Godfrey Henschen in 1643 - the so-called 'Bollandist dossier'. 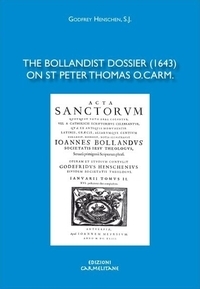 The Bollandists had already dismissed Carmelite traditions presenting figures from the early Church such as Cyril of Alexandria and Pope Telesphorus as Carmelite saints, and the treatment of the sources for Peter Thomas' life must be seen in the context of the critical methodology that the Bollandists brought to the study of hagiography. This volume contains a translation of Henschen's commentary on the Life by Philip de Mézières, which in itself comprises a critical comparison of this version of events with Wadding's papal bulls, and a translation of the version of the Life used by Henschen, from a manuscript of 1488, and which is printed in the second January volume of the Acta Sanctorum (Jan II, 990-1023). Since de Mézières originally wrote in French - a version now lost - this is effectively a translation of a medieval translation into Latin. The value of the book is that it provides a clear indication of the working methods of the Bollandists when faced with material difficult to organize and reconcile. It is fascinating to see Henschen weighing up Wadding's collection of papal bulls against the Life. However, as Patrick Mullins points out in the Introduction, the Acta Sanctorum text produced by Henschen is not a particularly reliable edition, and scholars wanting to study Philip de Mézières' text would do better to use the critical edition by Joachim Smet published in the same series in 1954. For non-Latin readers, however, this volume provides the only translation of the Life into a modern language. The series Textus et Studia Carmelitana has for many years performed an invaluable service by making available editions and studies of Carmelite texts that are not well known to the scholarly mainstream. 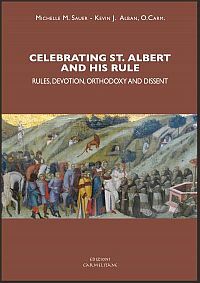 This volume confirms the value of the series and maintains its high standards of scholarship.